In 1939, the impressively named William Mozart McVey boasted that his classroom was “one of the best sculpture studios in Texas.” At the time, the College of Fine Arts was only a year old, but growing in popularity among students keen to take courses in art, music, and drama. Judging from the image, it was quite a baptism by fire—both for the shy-looking model and the students whose emotions seem to range from curiosity to concentration depending on their view. McVey left UT for his native Cleveland in 1953. 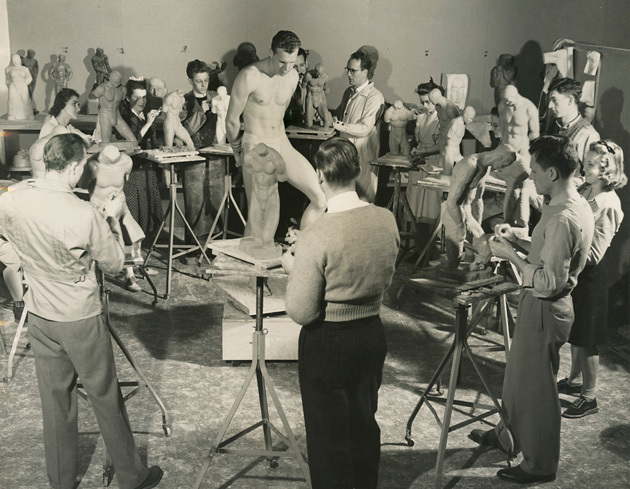 By then, the College of Fine Arts was a fixture on campus, as were life-drawing and sculpture classes. “It makes an art major’s day right interesting,” quipped the Daily Texan in 1950. The paper must’ve been right, as by then models included ladies in a bathing suits as well as en-thonged gentleman.